January 16, 2017 – This week, our time machine travels back to one of the past’s darkest corners, to meet Victor Capesius. Before the war, he was a friendly neighborhood druggist in Romania. But as World War Two progressed, this ethnic German rose from anonymity, to infamy, standing at the side of Dr. Josef Mengele, The Angel of Death. 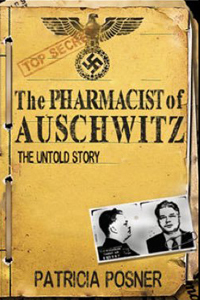 Patricia Posner brings us the true tale of this Nazi SS officer in, The Pharmacist of Auschwitz: The Untold Story . Together with her husband, Gerald Posner, our guest has authored 12 nonfiction books including Mengele: The Complete Story , Hitler’s Children , and most recently, God’s Bankers: A History of Money and Power . (Enjoy our interview on that title here.) We also make reference to our chat with Andrew Nagorski about his book, The Nazi Hunters . You can find our guest online at TrishaPosner.com. Her personal Twitter account is @TrishaPosner, and the one for the book is @AuschwitzPharm1.